To visit the British Columbia Rockies from Cranbook follow Highway 95A to Kimberley. Once a prosperous mining town, the city of Kimberley is quickly changing its main industry to tourism. With the development of North Star Mountain and its excellent conditions at 1300m (4,265 ft.) it has much to offer visitors. This beautifully landscaped flower garden and teahouse may be reached by a footpath from the downtown 'platzl' (plaza). The authentic train used in underground mining takes you on a 2.5 km scenic tour. 28 km (14miles) north of Kimberley Highway 95A joins Highway 93 coming from Fort Steele. Turn north on Highway 93/95 to Golden. 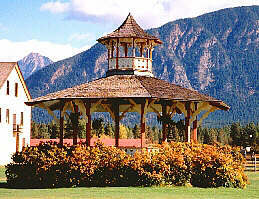 Located on Highway 93, north of the Highway 93/95 Junction, above Kootenay River is Fort Steele. The restoration of this historic site began in 1961. 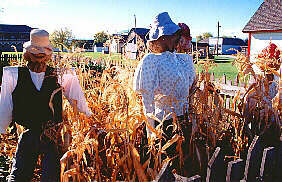 Visitors may view over 50 restored buildings and replicas in the area.